Before moving to New York, starting my internship at BSE Global, and meeting the entire MSBA family, I really had no idea what to expect. I had talked to past MSBA Alumni who also went to Santa Clara University (thank you, Casey and Abby) and both raved about the program and how influential it was on their professional careers. At the same time, hearing about the experiences, I still did not quite understand what I was getting myself into: the busiest two and a half months of my life. My daily routine is wake up, go to work, go to MSBA programming, get dinner with my fellow participants, and go to sleep. If I was completely aware of that routine going into the summer, I definitely would have been questioning myself and whether or not I could do it. Seven weeks into the program, this routine is second nature to me. This routine does not even feel stressful or tiring to me anymore and there is a simple reason why: I like going to work, I like going to programming, and I like ending my night hanging out with my MSBA friends. I have had jobs that I have not liked and remember thinking every morning about how much I was dreading going to work. Going to BSE Global does not even really feel like work. My “work” is often research about a topic I am obsessed with: basketball. Of course I prospect and make one sheets, but I also have been receiving projects that are ingrained in this core interest. An example of the two projects that have stuck out to me the most were working around augmented reality and seeing how this new technology can be integrated into sports, and a project with Nielsen ratings to see what kind of earned and owned media come from different LED banners around Barclays Center. While these are the projects that interested me the most, I get a large variety of projects each day, like those related to coming up with new activations for current sponsors, new potential sponsors that fit BSE’s venues well, and even some that are more creative like coming up with names for Brooklyn Nets projects that have not been released yet. I could not be more grateful to all my fellow interns who I have created a lasting bond with and all the members of the Partnership team who have taught me countless lessons about the industry. 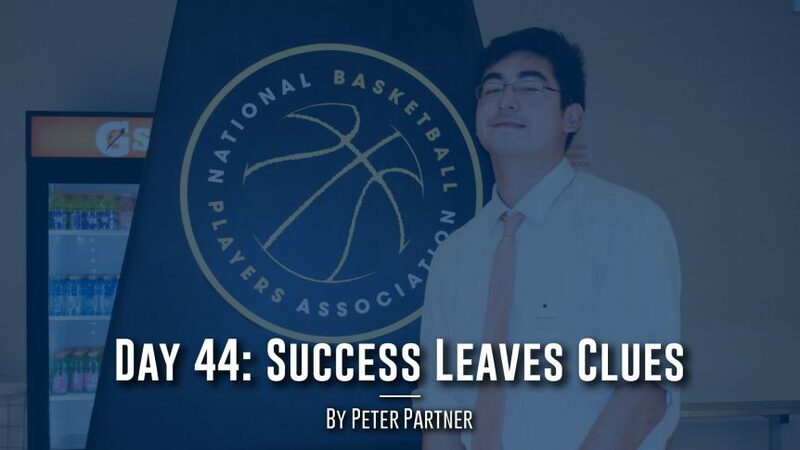 “Success leaves clues.” This was the sentence that stuck out to me the most when visiting the National Basketball Players Association on Monday night. If I was told last year that I would be at the Headquarters of the NBPA and getting to speak with six of their executives, I honestly would not have believed it. These six people each had their own success stories that showed when they told us about their paths to these dream jobs. Each one of them had unique entrances into the sports industry and are now extremely qualified due to their past experiences. Each one of their successes are not necessarily surprising because they have been leaving clues that they would be successful their whole careers. Through reaching out to our Speakers, my Mentors, and my friends’ Mentors, one thing that is evident is how impressive each one of their experiences are. Almost all of them have worked in the the most famous sports leagues, agencies, brands, and teams in the world. At first, seeing each of these people’s titles is shocking, but after recognizing the elite experience they each have it should not surprise me. All of these Mentors and Speakers have left trails of success. As much as this shocked and, in a way, intimidated me, it also excited me equally. I want an opportunity to work at these companies they are working at, and the idea that I am starting my journey to getting there makes me eager to go to work everyday. As I wrap up my time at BSE and being a participant in MSBA, I would just like to thank everybody involved in the most influential experience of my life. Starting from speaking with Casey and learning about what the Manhattan Sports Business Academy is, to reaching out to Lorne, Bailey, and David for the first time to learn the steps I needed to take to become qualified enough to be a member of this elite program, to Interviewing with BSE Global and speaking with my supervisors Amanda and Jeff for the first time, to arriving in New York and meeting 26 other amazing individuals at MSBA and the other 30 interns at BSE all attempting to break into the sports industry, to meeting with my Mentors, my peers’ Mentors, and esteemed Speakers from our Speaker Series, to learning from the entire Partnerships department at BSE Global and feeling included as a member of the team. I have too many people to thank and I can not be more grateful for that. To everyone that has been a part of this incredible summer, I can not express how thankful and excited I am to keep building this friendship with each and every one of you. I have no doubt in my mind we are all going to end up loving our work and leaving clues of success for the rest of our lives. See what makes the MSBA experience so special through the eyes of our students and visit our Alumni page to learn more about each author.